Now it’s time to show it to the authorities. And immediately the next round of “the fear of rejection” kicks in. What if your perception of “great article” is different from how authorities see it? What if you discover that something you’re so proud of is not actually as good at you thought it was? That is exactly what happened to me. And luckily, I managed to learn from it. There’s an article on BloggerJet that took me more than a month to write. It’s called “How To Write Content Strategically: The Guide To Getting Traffic, Subscribers & Sales With Your Articles” and it’s a mammoth 7000-word piece with tons of tips, examples, case studies and even custom visuals. I’m convinced that it’s the best piece of content I’ve produced to this date. And my confidence made me want to show it to the top people in my field. 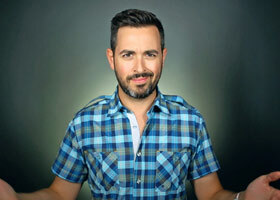 I’ve picked Rand Fishkin as one of my primary targets. This guy has a Twitter following of over 200K raving fans and a single tweet from him could do wonders to my blog. Actually I’m an adequate person and I perfectly understand that Rand will most likely ignore a “cold email” from a random guy, trying to make him tweet his article. But luckily I wasn’t a “random guy”. I once wrote an article for Moz blog, which became a top post of the year in three nominations out of four. I thought this should help me get Rand’s attention. Even though I had this weak connection with Rand, I didn’t honestly expect him to reply to my email (I’m sure he doesn’t have a lot of time for such things). Obviously I got a bit discouraged, that my content wasn’t good enough to make him want to tweet it. But that email made my brains work and I’ve learned quite a few lessons that I want to share with you. Despite the fact that my article on Moz was wildly popular, it happened 5 years ago and I’m sure Rand doesn’t even remember it. But I’m convinced that it’s the fact that I’ve mentioned that article, which made Rand treat me differently and actually reply to my email. offer your help in the fields where they are not very skilled, etc. This will dramatically increase your chances of getting some help from them in future. There are 150 articles published at BloggerJet to this date. Some of them are lame, others are better and a few are real solid. 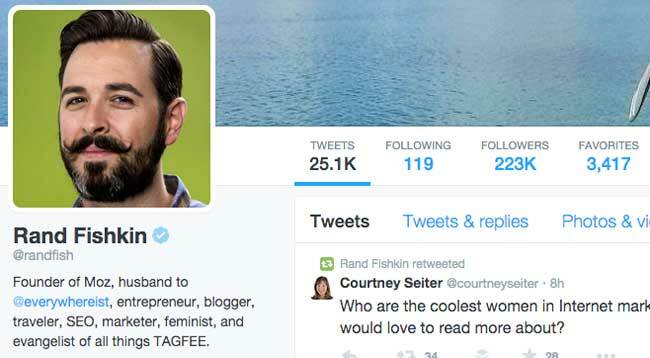 But only one article out of 150 was worth showing to Rand Fishkin (in my humble opinion). And even though Rand admitted it was “a very comprehensive and lengthy piece and I’m sure will be helpful to some folks” – it still wasn’t good enough for him. Despite the fact that my article didn’t make it to Rand’s Twitter feed, I’m sure it didn’t ruin my credibility either. I think he would consider me an idiot and put me to his blacklist. Only reach out to top people if you’re convinced that your article is worthy. Otherwise you’re going to shoot yourself in the foot. Rand is a top marketer of this planet. Hundreds of thousands of people watch religiously everything he says and does. What are the odds that he will tweet a 7000-word article that neither he, nor anyone on his team have read? I guess he could possibly tweet that same article if it was a guestpost at Moz, because this means that it was thoroughly checked by his editorial team. If you really want an influencer to tweet your article – go submit it on his blog and make his editorial team approve it first. And the last thing I want to share with you guys is two psychological principles that I’ve used in my outreach email. Both tricks are the courtesy of Dr. Robert Cialdini that I’ve learned from his amazing book “Influence: The Psychology of Persuasion”. Humans generally tend to return favours and once you do someone a favour, he will feel obliged to reciprocate. My super successful post at Moz was some kind of a favour to Rand, which I’m sure was the main reason why he replied to me. According to Robert Cialdini, we have a deep desire to be consistent. Once we’ve shown our commitment to something, we’re then more inclined to go through with it. I told Rand that I was an author of a post, that was once very popular in his community, which led to an assumption that my other article might be just as good. Obviously that wasn’t enough to make him tweet it, but at least it made him click the link and skim through it. The topic of content promotion and specifically “influencer outreach” is getting tons of attention lately. Even my own inbox is regularly bombarded with “cold emails” from random people, trying to make me tweet their articles. But I’m hoping you can learn from my story just as much as I did. Use my takeaways to adjust your outreach strategy and get the best results without shooting yourself in the foot. And I’m really keen to hear your own “influencer outreach” stories! Did you ever reach out to the top people in your field? Fab post! Why? Because if you get over this fear, you’re golden. In truth, we’re always being accepted by more people, by good matches, so embrace that idea and detach from worrying about anybody not being a match…..from well known folks, to anybody out there. Great write up, Tim. May I suggest a completely different approach. “Influencers” are inundated with requests for attention. They make for poor targets. Why not instead focus on people who are somewhere at your own level and below? It’s much easier to form bonds with your peers, and there’s real strength in numbers. “. . .I didn’t see a lot of highly unique suggestions.” Was he right on this, and why did you skip it? Hey Don! Thanks a lot for bringing this up!!! Yeah.. I actually totally forgot to share my opinion on this one..
You can be a real smartass, but compared to the top people in your field – you’re just an ordinary guy! Whenever you learn something – you become more knowledgeable than millions of other people in the world, but there will always be people, who know much more than you.. So.. like Rand said.. my guide will be useful for some folks.. but there’s nothing new for him and people like him. “”I went on to read the article word-for-word (I usually skim articles but yours grabbed my attention, all 7000 words). Tim, I have to agree with Rand — if I was speaking about THIS particular post. I already knew everything in here! FYI, when I wrote my guest post on Aha!NOW (that ended up receiving 163 comments before the owner closed the comments! ), I took a unique approach and sent emails to a dozen people, seeking their permission to use their headshot in a specially-created graphic I was hiring a designer for, just for that post. I received a positive response from nearly everyone! Then I followed up that post with a post on my own blog. yep! it amazes me how many comments you get on your articles! No big secret, really. Comment on others’ posts, promote the posts on social media, reciprocate sharing, thank people when they share my stuff — the usual practices that most successful bloggers do. I’m not sure why others are making a point to say “I already knew that” but hey I guess all feedback is good feedback. I like this quote and agree completely. It doesn’t matter what level you’re at in your niche because if you know something then you will be ahead of some but behind others at the same time. I’m relatively new to blogging in my niche and although my writing may be seen as juvenile to some, others have thanked me for being super helpful. I’m sorry to say this but I’m glad this article didn’t finish with – “Oh by the way, I changed some stuff and Rand totally tweeted me 100 times”. Don’t get me wrong, I want you to get the exposure! However this way you still seem human. Hey, even I knew some stuff but it doesn’t stop the article being helpful and actually inspiring me to write more but it also gave me further advise to improve my writing and so many others will get value from it. you have the point Glen! this article is not about “knowledge” it’s about showing people that even when they do craploads of work – they still may be rejected.. 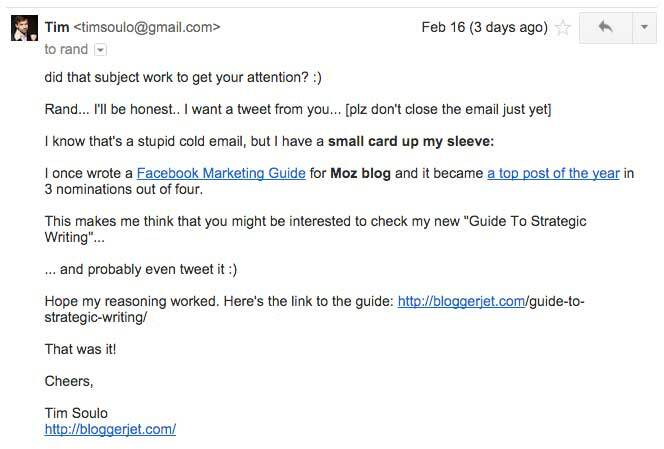 I discovered this interesting lesson after receiving the MOZ newsletter you mention in your update. There is a pleasing circularity about that, I think. On a slightly different note, in publishing and in music (including DJing perhaps, Tim?) a ‘rejection’ letter is widely viewed almost as cause for celebration. Only being ignored entirely is perceived as an outright snub. I would say that this applies in the case above. In Rand’s ‘Whiteboard Friday’ vlog “What Separates a Good Outreach Email from a Great One?” (linked below), he mentions the sheer volume of messages he gets, and describes how – despite this volume – strategies like your own can be used to elicit a reply. Sounds like you anticipated (or followed) Rand’s own insights quite effectively. verry good article , love your posts , thank you ! Excellent – you got mentioned by Moz, that is honestly no less a feat! Regarding the tweet, you almost 99% made it. Getting someone like Rand read or atleast skim through your post is an achievement. And who knows, he still might read your new posts and might tweet out something. Thanks to your plugin, I got plenty of huge tweets myself and they all are very strong influencers – am sure most of them might not even notice my tweet, but now they are tweeting me back. And from all this the lesson that I learnt is that – if you want to get noticed by an influencer, get a referral from an influencer. Hello Tim, This is the encouraging post for the bloggers who give there hundred 100% to create informative posts and shared them on their blogs but they failed to achieve to get the visitors attention. Here i share my personal experience with my twitter account there i tweet a post of graphic design expert and i just mention his name with post he is surprisingly come and favorite it.. So making engagement on your post it is necessary to come and participate on other blogs and share them on social sites.. If they feel you take interest on their stuffs than they automatically come to your posts.. I am surely featuring this blog post for sure….. Mhen! You got balls bro and it was worth it lol. I could agree more with Dino Dogan though and am going by his suggestion. Anyways thanks for this awesome read. Thanks for sharing your experience! I am no shark, but my blog does get its share of publicity and I do get these kind of emails from time to time. In my opinion, reading your email to Rand, I think a more human approach to this email might have received a better response from him. Your email sounded to me very formal and like a tone of voice that I would expect to get from a sales person trying to sell me something. My name is Tim (I wrote the FB marketing guide on the MOZ blog a few years ago which recieved a lot of traction). I wanted to ask you if you would consider sharing it on your twitter profile (if you hopefully see it fit). I’m sure a lot of your follwoers could benifit from such a post. Of course the wording does not matter that much, but you get the feel of the tone of voice. I actually wrote a few like this to so called “sharks” and had success. The tricky subject line, the “did i catch your attention?” Line, the use of wordshortening like such a strong word as “please” to the so not serious “plz” make a lot of difference IMO. Also, like when sometimes you want to say that something is amazing but you be careful not to say it because it should not be written if its so amazing and people would find that out on their own and appreciate you for it – the same goes here with the “I have a card up my sleeve”. Yeah- you did have a card up your sleeve, but I think you should not have written this in the email because this is something that creates great antecipation to read the next line and takes from its own impact. All and all – love your writing man! Just wanted to express my view based on my own experience as someone who gets these kind of emails and also as someone who writes them. Thanks for stepping by and adding so much value to my initial post! hey Tim, I was messing around with my blog setup quite a bit.. possibly screwed up a few things here and there.. I once reached out to Rand to invite him to appear in one of my expert roundups. It may seem foolish, because I already knew that he didn’t want to appear in roundups anymore, but I wrote to him a pretty long email in which I tried to defeat all the objections that I knew he may have. He actually respond it after a few hours. True, he denied the invitation, but his reply started with “I appreciate your diligence and effort”. I think he is a really great guy. The most important think when someone approaches an influencer is to make time to get to know him. People feel when an email is personalized and you are talking with him directly. Sometimes even if you receive a no as an answer, it’s better than no answer it all. It means that person made the time to respond to you. I have reached out to people and got surprising results. In my early days I would ask for advice from people at the top of the industry. I would get over 50% of them replying, often with great points. Some became mentors and I stayed in contact for years. I believe in paying things forward and if you get an email from someone who’s just looking for that guidance, it can mean the world to them. Great article. I have 10 tabs open like most people and thought I’d like to signup for future posts as your content is good. You really should have a signup to the newsletter form! Such a basic step missing. P.s. went back and checked the only way to subscribe is for that headline you used.